Quinoa (keen-wa) is a powerful vegetable seed that contains all 9 essential amino acids; it is a good protein source, low GI rating and is gluten-free. It is similar to amaranth. 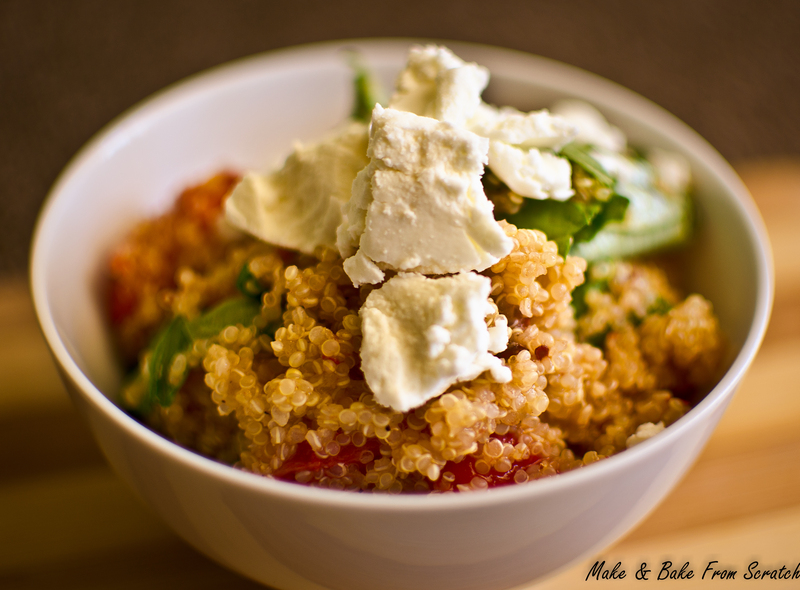 Quinoa is a versatile seed and can be consumed in both savoury and sweet dishes. When using quinoa in cooking it is imperative you soak the seed for at least 8 hours to reduce phytic acid levels. An acid called “Phytic Acid” basically hinders the absorption of all the goodness present in this beautiful protein seed. By soaking overnight (minimum 8 hours) in filtered water you reduce the phytic acid level which in return will allow you to absorb all the wonderful enzymes. It is recommended that you soak rice, quinoa, buckwheat, millet even nuts and seeds to receive optimal nutrition. You might consider this time-consuming but always remember a short-term pain is a long-term gain when it comes to your health. Of course you can still eat the quinoa without soaking it you just won’t absorb all the nutrients sufficiently. I added melted coconut oil, roasted cherry tomatoes, fresh basil and goats’ cheese to enhance the flavours. You can have it for lunch, dinner or a snack. The recipe is gluten-free, sugar-free and packed with quality protein and fats. Feel free to add your own spices and flavours. Soak quinoa for at least 8 hours before consuming. Cook quinoa, see instructions on packet. Once cooked allow to cool. In a mixing bowl cover cherry tomatoes in 1 teaspoon, melted coconut oil. Place on a lined flat baking and roast for 20-25minutes (varies with oven temps), until they are soft, I like the tomatoe skin to brown a little . Remove and allow to cool. In a large mixing bowl add quinoa, roasted cherry tomatoes, chopped basil, melted coconut oil, pepper and salt; mix all ingredients together. Serve in a bowl and sprinkle goats’ cheese on top.